Concerns new purchases from 2019 onward. During registration, you can choose two instrument packs with the Stage version, three with the Standard version and four with the PRO version. These instrument packs are fully working whereas remaining instrument packs are available in demo mode for your evaluation. You can purchase additional instrument packs at any time. In PIANOTEQ Stage, preset loading is limited to parameters that are present in the interface. Presets built with PIANOTEQ PRO can be loaded in PIANOTEQ Standard without limitation. PIANOTEQ PRO lets you edit 30 parameters for each note on your keyboard. In PIANOTEQ Standard, you can explore this feature with the volume and the detune parameter. PIANOTEQ PRO offers an internal sample rate of up to 192 kHz. Up to 48 kHz in PIANOTEQ Stage and Standard. 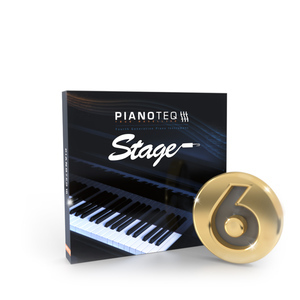 Pianoteq Stage 6 is a popular choice for the budget-minded musician. It is based on the award winning physical model, offered in Pianoteq 6 Standard and PRO, praised by many musicians for its close intimacy and responsiveness. 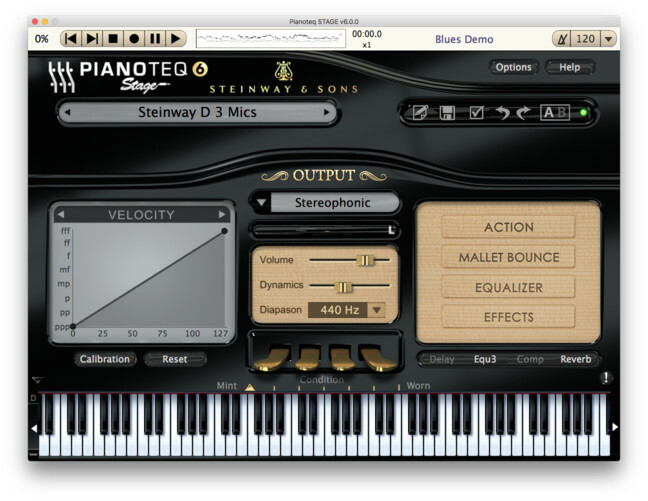 Pianoteq Stage 6 includes the same sounds and playability. All this for an unbeatable price. The simpler interface in Pianoteq Stage 6 is adapted for musicians who want the convenience of a selection of beautiful instruments for an immediate playing session. It is not for tweaking settings and parameters. Pianoteq Stage can at any time be upgraded to Pianoteq Standard or Pianoteq PRO to gain further sophisticated features, such as to tweak the physical model, to load Scala temperament files or to position virtual microphones around the instrument. With Pianoteq Stage, you are not locked to a certain product but have the option to upgrade whenever needed. Pianoteq Stage supports all Pianoteq instruments, and if you upgrade to Pianoteq Standard or PRO, the instruments themselves upgrade automatically at no additional cost. Optional instruments are sold separately.